The Parisian jeweler reveals a lighter and more playful side with the new Perlée, which takes the golden pearls border of the Alhambra collection and turns it into a signature style. Since Van Cleef & Arpels’ founding in 1906, the acclaimed Parisian house of high jewelry has been associated with utterly sublime creations. From the Minaudière and the Passe Partout bracelet to the Zip and Alhambra necklaces, Van Cleef & Arpels is responsible for some of the 20th century’s most iconic jewelry. In these photos you can enjoy the elegance and playfulness of the Perlée collection, which strings together beads of white and pink gold in a metallic interpretation of the classic string of pearls. The current collection has its roots in the cultural upheavals of the late 1960s. At that very moment in time, Van Cleef & Arpels launched the now-classic Alhambra collection, with its signature stylized quatrefoil representation of precious stones encircled by a formation of golden beads. A reference to a fine jewelry technique from the 1920s, the beaded border or contour perlé was a key aesthetic factor in the success of the Alhambra. In fact, the beads are part of the inheritance that the Alhambra collection left to the Perlée. 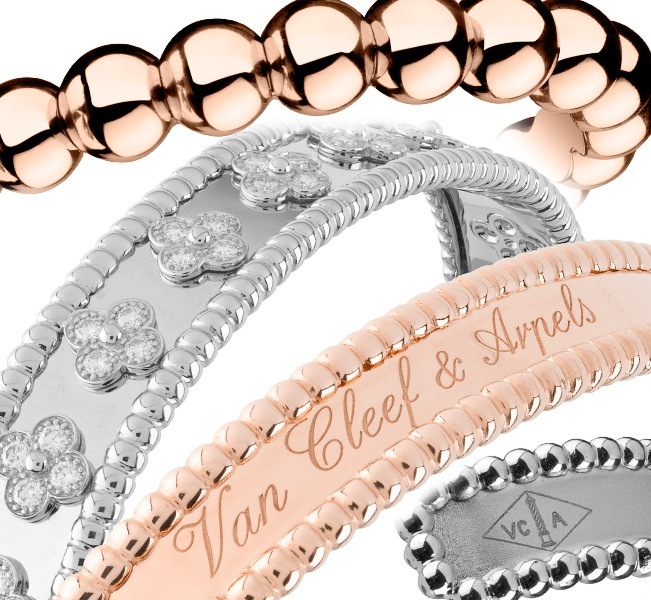 Van Cleef & Arpels describes the border in this way: "Such is the signature of the pearled border, an adornment that highlights a woman’s allure time and time again…" This shared characteristic ties both collections to each other, to the craft and the trade and to the history of the house of Van Cleef &Arpels in particular. 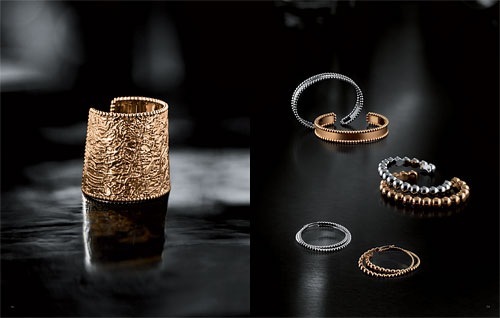 The rings and bracelets are designed to encourage the creative spirit, with the possibilities are defined by the owner’s inclinations. These variations are made possible by combining bracelets of different materials, either pink gold or white gold, and different designs. 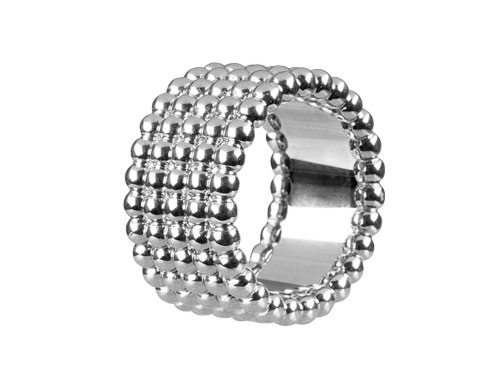 The Perlée collection is everyday jewelry that fits every season. 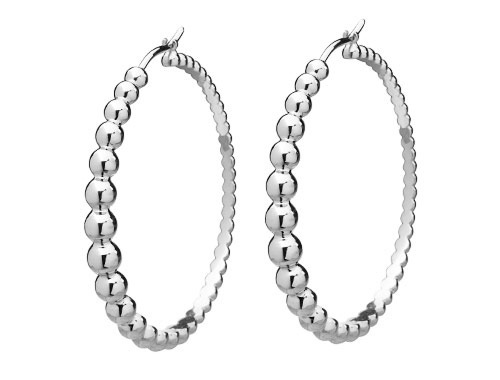 While most items in the Perlée collection are slim, including the earrings, the width varies according to the design. 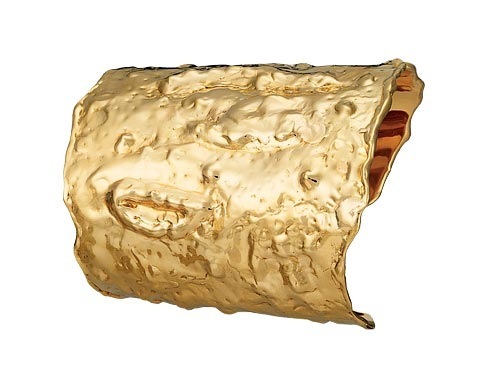 One notable variation is the crumpled pink gold cuff , inspired by the Etruscan civilization of present-day Italy. Van Cleef & Arpels first explored this theme in 1970, with a limited edition consisting of necklaces, cuffs and hoop earrings, all in yellow gold. The inimitable Jacqueline Kennedy Onassis was a fan. By way of closing, the brand sums up the collection in this way: "Light, charming and spirited, the new Perlée collection epitomizes a modern but timeless elegance, which is the hallmark of the Van Cleef & Arpels philosophy."